On June 4, the ‘Longhu Mansion’ 8th China Tangshan International Automotive Exhibition (Tangshan Auto Exhibition) was successfully closed in Tangshan International Conference and Exhibition Center. The show was hosted by CNAICO and CCPIT Hebei Sub-Council, supported by Tangshan municipal government and Automobile Industry Association of Hebei Province, co-hosted by Tangshan municipal business bureau, CCPIT Tangshan, Tangshan Labor Daily, and Tangshan Evening News. The executor of the show was Tangshan Dongfang International Conference and Exhibition Center Co., Ltd. Covering an area of nearly 50,000 square meters, the exhibition was composed of three parts: imported cars, high-end cars and joint ventures and home-grown cars. The six-day show attracted 211 car dealers from 12 countries and regions as exhibitors and 300,000 visitors. Vehicle sales during the show totaled 2,866 units, 520 units of which were luxury cars. The number of exhibitors, show cars and visitors, the area of exhibition and the amount of sales all achieved a record high, compared with the previous seven exhibitions. The show won unanimous recognition among government leaders, automotive professionals, public media, exhibitors, and visitors, achieving the best result in recent years. Many home-grown brands and joint venture brands launched their new models and shared best selling models with Tangshan consumers. 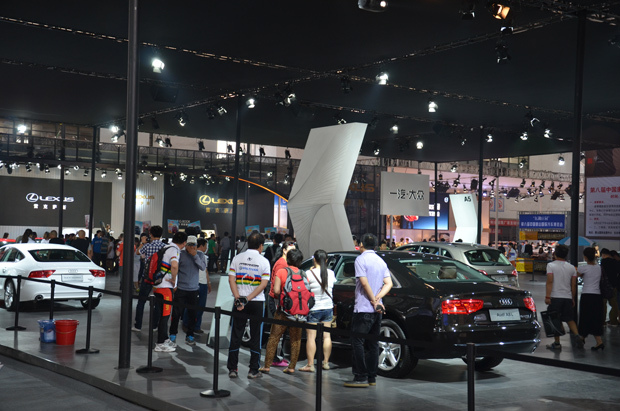 In addition to classically luxury brands such as Rolls-Royce, Bentley, Lamborghini, Ferrari, Maserati as well as other high-end brands such as Mercedes-Benz, BMW, Audi, Cadillac, Infiniti, Acura, Subaru, Chrysler, Renault, Buick and Chevrolet, Harley Davidson motor cycle and Brabus-Benz made their debut in Tangshan, highlighting the exhibition. Further, the organizing Committee promoted diversified cultural activities, such as "stop drunk driving, starting from me" autograph campaign, "I visited the show" photography contest, "Development and transformation" -2012 8th China Tangshan Automotive Exhibition Summit, and showgirl performance and competition. These automotive-themed activities conferred the show with more cultural connotations and highlights. After eight years of nurturing and forging, Tangshan International Automotive Exhibition has developed into the most influential event in automotive industry in Bohai Sea area. With sales of hundreds of millions yuan, it has become a successful model for Tangshan Exhibition industry. Under full support from municipal government and other concerning parties, Tangshan International Automotive Exhibition will not fail expectations of domestic and foreign exhibitors, but make great endeavors to enriching the culture, boosting the sales and achieving the prosperous market of automotive industry !